No matter what team you root for, we can all agree that green is a color we want to see more of. And that’s why Suffolk Federal is continuing to expand its transition into the world of clean energy with the installation of solar panels at its Medford branch. 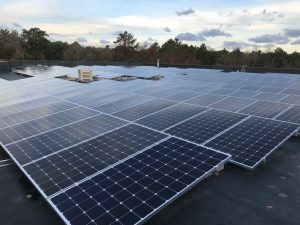 The Long-Island based credit union recently partnered with SUNation Solar Systems to install clean energy solar panels on the branch’s rooftop. Solar panels reduce the use of man-made electricity by harnessing the power of the sun instead. Locally-founded SUNation is one of the area’s leading installers of solar power technology, working with over 3,500 Long Islanders since its inception 15 years ago. “We embrace Suffolk Federal’s commitment to making Long Island a better place to live and work for generations to come through clean, efficient solar power and are committed to supporting their efforts to continue to ‘Go Green,’” explains Mike Bailis, Co-Founder of Ronkonkoma based SUNation Solar Systems. Suffolk Federal also completed the installation of solar panels at its Islandia and Riverhead branches and moving forward, will build upon ways to expand its use of renewable resources for its more than 60,000 members. SUNation Solar Systems is the local solar expert trusted by over 3,000 Long Islanders since 2003 for professionally installing the highest quality and most durable equipment. We pride ourselves on our professionalism, customer service and providing the highest level of customer satisfaction. We are your neighbors – we live here, we work here, and we give back to our communities. Our not-for-profit corporation, SUNation Cares, provides the gift of free electricity for life to select Long Island families in need. We strive to make Long Island a better place to live for generations to come through clean, efficient solar power. SUNation has earned “Best of L.I. Solar Business” for nine years running, “Best Alternative Energy Company” for seven years running and “Best Green Business” for six years running. We rate in the top ten solar companies out of 500 on Angie’s List. And we boast an A+ rating from the Better Business Bureau.